BROCKWAY – In an evening that featured only seven bouts, Brockway came away with five wins while also obtaining five forfeits to best their District 9 AA opponent, the Curwensville Golden Tide on Thursday night. Curwensville was only able to come up with two wins at 138 and 152, respectively. Curwensville also picked up two forfeits. Junior Zach Holland (2-0) notched a fall at 138 when he pinned Brockway’s Jared Fremer in the second period, and sophomore Duane Brady (11-11) then pinned the Rover’s Conner Ryckman in 5:02. 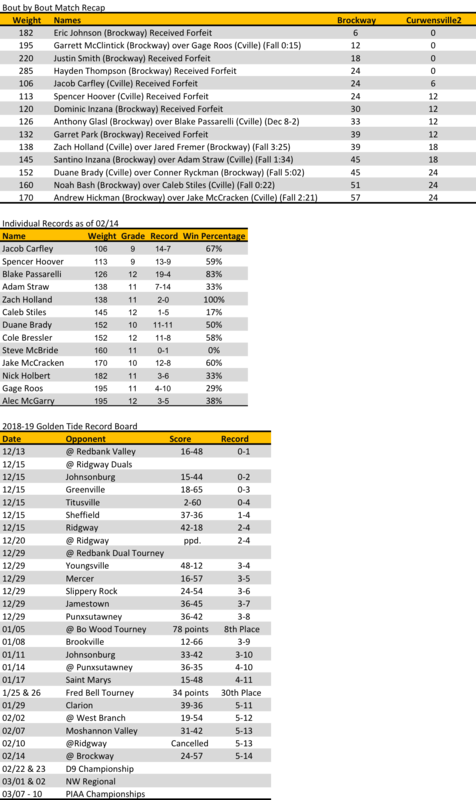 Jacob Carfley (14-7) at 106 and Spencer Hoover (13-9) at 113 received forfeits for the Tide. In a highlight match of the night, senior Golden Tide wrestler Blake Passarelli (19-4) wrestled junior stud Anthony Glasl from Brockway. Glasl handled Passarelli and beat him 8-2. The two will likely meet up in the District 9 AA Championships in two weeks. While Passarelli took 8th at states last year, Glasl took 6th as a freshman and did not place last year. The Golden Tide finished their season 5-14 overall, pending a possible meet with Ridgway, if the match is made up. The Tide finished with exactly 100 individual wins which included over 30 pins and half a dozen major decisions. The District 9 AA Championships are set to begin on Friday, February 22 at the Clearfield Area High School. All AA Wrestling will be held in the Bison Gymnasium.